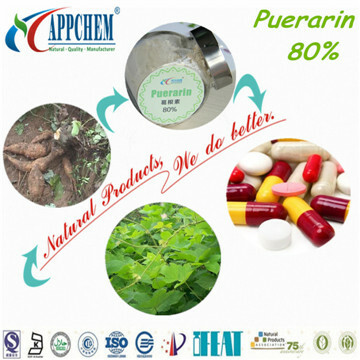 [English name]: Pueraria Root P.E. [Application scope]: Kudzu root flavone is a kind of isoflavone compound extracted from roots of wild kudzu, whose main ingredients are puerarin ,soybean isoflavone,daidzin and genistein,etc. Its pharmacological action can improve microcirculation,dilate coronary artery, increase blood stream volume of brain and coronary artery, reduce heart rate,reduce index of myocardial oxygen consumption as to improve the metabolism of ischemic myocardium.it also has functions fo resisting thrombus,raising the high-density lipoprotein,resisting vasospasm, and reducing platelet aggregation, in clinic it is mainly used to treat diseases like alcoholism,arterial and venous embolism of retina,sudden deafness,myocardial infarct,coronary heart disease,angina pectoris hypertension and high blood fat, etc. [Process flow]: Pueraria Root → Solventextraction → Concentration →Vacuum drying.